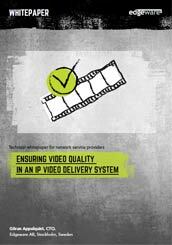 The first IP video delivery solutions were implemented in fully managed operator networks, mainly addressing set-top boxes. Today, we have a much more complex world, where adaptive streaming technologies are used to deliver http video to a multitude of devices over different types of networks. Mobile devices and PCs are now common terminals and more and more traffic is delivered over wireless networks. This paper will explore some of the challenges encountered when trying to maintain video quality under these new conditions. To learn more, download the free whitepaper.